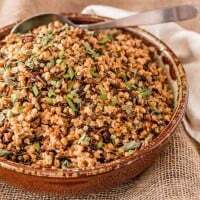 Instant Pot Farro and Wild Rice Pilaf (or Stove Top) with dried cherries, fresh herbs, and toasted hazelnuts adds delicious flavor and texture to your holiday table. With your Instant Pot/pressure cooker, you can have this healthy side on your table in less than 45 minutes! This recipe first appeared on Pressure Cooking Today where I am a monthly contributor. Holiday menus tend to be heavy and rich. I do my fair share of “splurging” during the holidays, but I also try to keep as much to my typical fare as possible. Whole grains are always part of our healthy diet. We love farro. 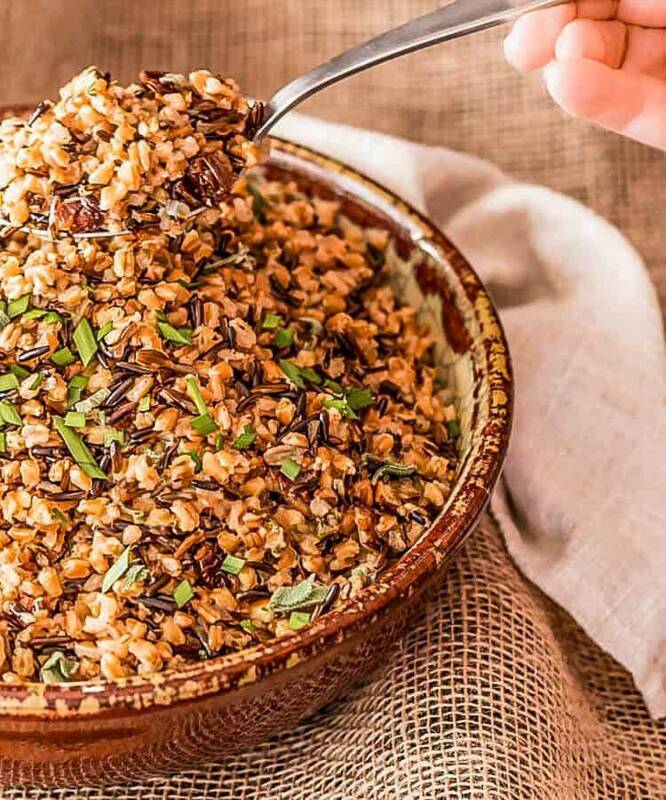 Farro is perhaps more common in Italian cuisine, but it is beginning to catch on in the United States. 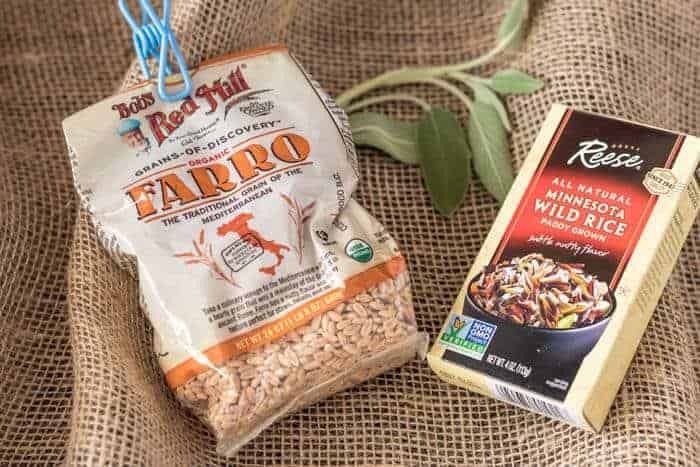 Wild rice is a natural pairing with farro as both are best with a little bit of a “bite” or tooth to them. Mushy grains are not very appetizing. Fresh herbs – parsley, sage, rosemary, thyme, and chives – seem so appealing this time of year. My herb garden is thriving with our cooler days in south Texas, so they were a natural addition to this dish. I have always loved dried cherries with wild rice, and toasted hazelnuts, well, aren’t they good in almost anything? The “trick” in putting together this dish was in figuring out the proportion of grain to liquid. After much research, I discovered that farro is frequently soaked for hours or overnight, then cooked for about 30 minutes. I don’t know about you, but I’m not likely to plan a day in advance. 😉 With the pressure cooker, the soak is unnecessary. If you’re cooking Farro and Wild Rice Pilaf on your stove top, you can skip the soak, but will need to periodically check for doneness. Remember: Mushy grain is not appealing! Farro can take anywhere from 30-40 minutes depending on your specific grain. Check your package for an estimate. 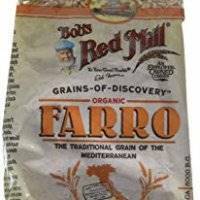 I use Bob’s Red Mill Organic Farro. The stove top instructions specify rinsing and simmering 30 minutes after bringing to a boil. Wild rice requires a bit more time. I would give the wild rice a 10 minute “head start” for the best results. My experience in years of cooking wild rice and grains is that cooking liquid varies from one dry batch to the next. The key is to concentrate on getting that al dente texture, and not worry about having all of the liquid absorbed in the cooking process. Once you toss that preconceived notion, you may be very pleased with the results! Both methods use additional liquid which will get drained off after cooking. Use a fine mesh sieve to capture the minced herbs. I like to save the drained liquid to add to a pot of soup later. Whether you use a pressure cooker or your stove top, you will want to sauté the onion or shallots, garlic, and grains in a bit of olive oil prior to cooking. I hope you will give this one a try! 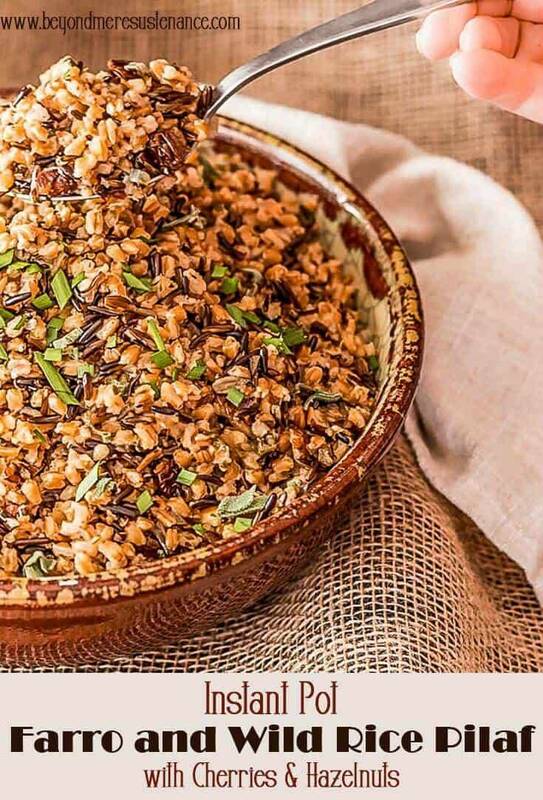 Wild Rice and Farro Pilaf with dried cherries, fresh herbs, and toasted hazelnuts adds delicious flavor and texture to your holiday table. You can have this healthy side on your table in less than 45 minutes! Saute the onion and garlic in a drizzle of olive oil in the pressure cooker. Add the wild rice and farro. Continue cooking until they are fragrant. Add the broth/stock, herbs, salt, and pepper. Lock the lid in place. Cook 25 minutes (rice/risotto setting) or high pressure on stove top. Meanwhile cover the dried cherries with boiling water for 10 minutes. Drain. Toast the hazelnuts, and coarsely chop. 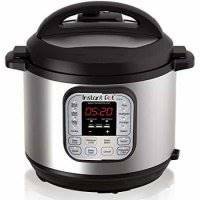 After 25 minutes, allow pressure cooker to de-pressureize 5 minutes, then release pressure fully. Saute the onion and garlic in a drizzle of olive oil in a medium saucepan on medium-high heat. Add the wild rice. Stir to coat. Add the broth/stock, herbs, salt, and pepper. Cover. When the liquid comes to a boil, reduce the heat to a simmer. Cook 10 minutes. Rinse the farro. Add to the pot after the wild rice cooks 10 minutes. Continue to simmer until the rice and farro are al dente - still firm. 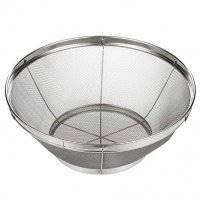 Drain the liquid from the pot using a fine mesh sieve. Add the rehydrated cherries and toasted hazelnuts. Toss to combine. Garnish with fresh herbs such as chopped chives and thyme leaves. I use about equal parts fresh parsley, sage, rosemary, and thyme, very finely chopped. When using dried, cut the amount in half. Do not use quick-cook farro in this recipe. It has been pre-cooked and dried and requires only 10 minutes. That won't work with the wild rice, unless you are prepared to add it in just 10 minutes before the wild rice is done! Dried cranberries are a great substitution for the cherries. Macronutrients are an approximation only, and based on MyFitnessPal.com output.